Let's Get the latest Fashionable looks by Jennifer Winget and Mouni Roy.. I love Bollywood actresses and adore their amazing fashion sense. But these days the television actresses are also rocking the ramp . 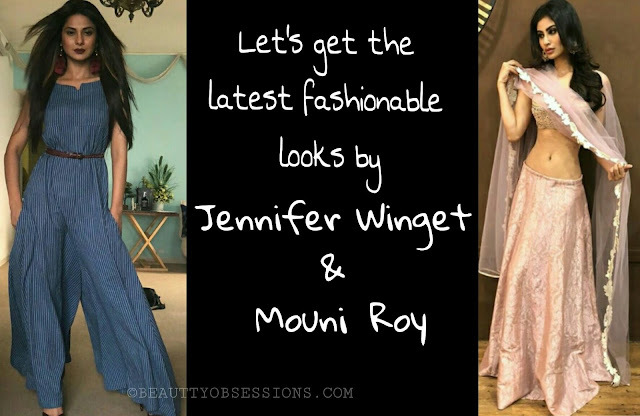 I personally love the fashion sense of the beautiful Jennifer Winget and dashing Mouni Roy . I am a huge fan of Jennifer since childhood from her show Shaka Laka Boom Boom . Day by day she has transformed a lot and now has become a fashion icon. This is the same in case of Mouni Roy as well. She is more famous as Nagin after her show Nagin on television . This gorgeous actress has awesome fashion sense and has done few films in different languages as well. This Bengali beauty never fail to impress us with her fashion looks.. Here I am sharing few looks of these television beauties which takes my heart away .. 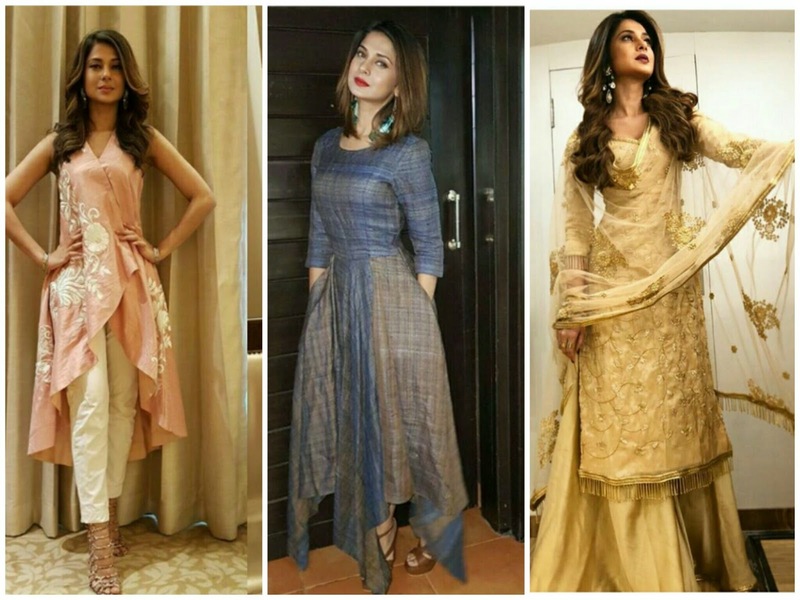 These pictures of Jennifer Winget from some the latest fashion looks . Not only she is looking beautiful but also she is complimenting all the looks perfectly. We all know that, when a fashion icon wore something new, that suddenly becomes the fashion trend, isn't it? I love the way she carries both Indian and western looks. Again her look from her recent tv show Bepanah is so much in talk now. She is always a style icon for so many girls and she will be in future as well. If you want to get the looks carried by Jennifer Winget, then there is a secret which I am going to reveal at the end of the post, hence keep reading. Now tell me, aren't these pics of Mouni Roy looking mind-blowing ? If I will say, she is a true diva, then you will definitely agree with me. She carries both Indian and western looks so gracefully. Her jewellery with Indian attires always in talk. 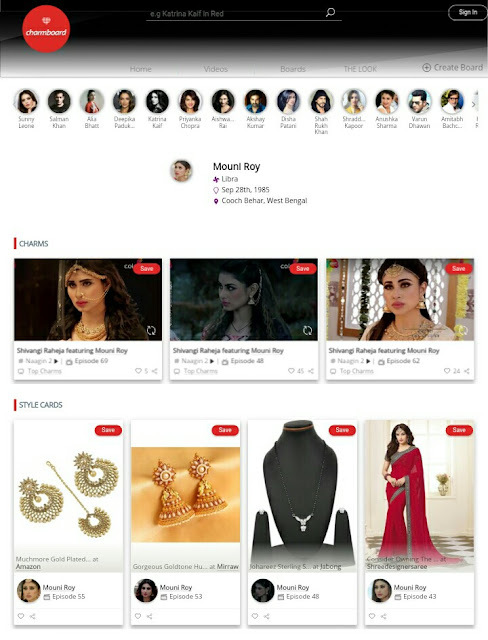 Every girl wish to own such traditional jewellery collection like Mouny Roy wear. She is super stylish and so much inspiring for all fashion lovers. Well, now come to the surprise part of this post.. 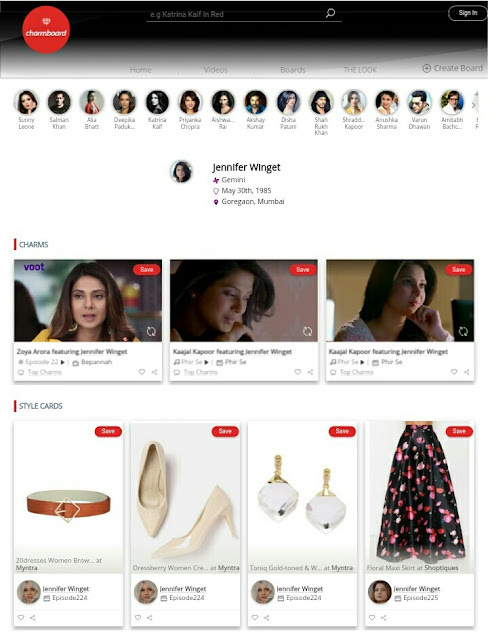 If you want to carry such elegant looks (by means of clothes, jewellery, accessories etc) by your favorite actors / actresses , then there is a website called Charmboard which can make your dreams come true. For example, if you want to achieve the look of Mouni Roy in Nagin of certain episode, then just type the detail on search bar of the Charmboard website and you will get so many options for this look and after clicking on the desired product you will immediately redirect to the shopping sites like flipkart, Amazon, Myntra and you can make your purchase from there.. Isn't it sounding cool and exciting ? Then there is another option called 'create board' , where you can create your own board by adding products from other existing boards. Another option is 'style cards' , which is an unique combination of charm and an inspiring product under that charm. You can create your own style card by clicking on the save icon under the product next to the charm. Like this there are so many other options also present which makes your makeover process smoothly and excitingly. So why are you waiting for, just explore the site and be stylish and be fashionable . Jennifer Winget is my absolute favorite, I really love her. Her style and fashion is so elegant and gorgeous! The looks are insanely fashionable. They are style icons of millions. Loved your take. How elegant looks these are, m being flaunted by them. Charmboard seems to be a great site offering these options. Even I love to see celebrity style all the time, and this website looks so so helpful indeed. Jennifer Winget and Mouni Roy are truly fashionable divas. Loving the fashion looks shared above. Abs amazing ! Both of them are stylish and I like the way they carry themselves confidently. Great recommendations.